Nick and A Couple of His Friends! 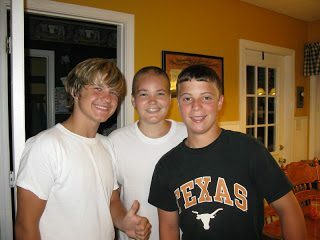 Brandon, Nick, and Troy have been friends since they were four years old! What joy filled my heart as they doorbell rang the other night and these two young men were at our door to see Nick! Now teenagers, these guys still love to laugh and share life! They all love sports, but more than that, they all love the Lord!! That’s what makes their friendship so special to me! What power Christ brings to EVERYTHING He is part of! The love between these boys runs deeper than anything this world can offer alone. They all know who they are, why they are here, and where they are headed! When you can answer these tough questions, you can face each day with a smile just like these guys! The joy of the Lord is their strength!! I realize more and more every day that during those times in my life when everything is fairly “normal”-no big surprises, worries, tragedies, frustrations, etc.-I need to be thankful for the peace that comes with them. That is where I am today. I am in the little pocket of peace. Why? Because yesterday we found out that the tiny knot on Nick’s forehead is not a tumor. The brain surgeon thinks it is a tiny piece of metal or something. Now, how it got there I do not know. Maybe in surgery. Our pediatrician said she has seen things like this before in kids who have hit their head and tiny of fleck of something has worked its way through their skin! No matter how it got there, we are just thankful for doctors who can read x-rays and say confidently, “no tumor.” Also, Dr. Kosnik (our brain surgeon) said that it was okay for Nick to go to Myrtle Beach next week as planned, and he would just see him when we get back! So, for at least two weeks, we do not have any planned encounters with the medical world! Now that brings me peace! While I know that our life still holds uncertainty, I am committed to savoring this family time and cherishing every minute! God continues to show me that by letting go and trusting Him, He never takes me down a road that goes further than I can handle. He stretches me to new distances at times, causing my feet to ache from the rough road. However, just when I think I can’t take one more step, He smooths the road and lets me run freely. Thank you, Lord, for loving me enough to step in when I am ready to step out. Thank you, Lord, for giving me time in my pocket of peace. I promise to bring You the glory even from this sanctuary. You are my Rock and my Fortress! I find rest in You, O Lord! I whisper these words to myself every time my chest starts caving in. Our day yesterday was long and tiring. Nick had bloodwork, an appointment with Dr. Cook, and then another trip to the hospital for a lot of x-rays, and finally another appointment with Dr. Cook. We now know that his bloodwork looked good, and we were thankful! They are going to send all of his x-rays by Fed Ex today to Dr. Kosnik, who is on vacation. So we won’t know much more until tomorrow. They may be moving his MRI up to this Friday. That is what Tim is working on today. So, for now, we wait…….. Deep faith comes through trusting God in spite of our fear. This makes prayer complicated to me in one way and very freeing in another. In just an hour and a half I am taking Nick for bloodwork and an appointment with his pediatrician because he is not feeling well and we are concerned. On the one hand, I ask for prayer that Nick is okay. I beg God to totally heal Nick. And yet, because of my deep faith in God, I trust Him no matter what. That’s where prayer gets complicated for me. What I long for I no longer expect. What I ask for I no longer feel entitled to. So as I pray, my heart and mind leap back and forth from my human mommy heart to my trusting child-of-the-King heart. This dancing between both worlds can be exhausting. This is where prayer is freeing. I place Nick in God’s hands daily and especially today as I prepare to tell him that we are headed to Ashland for an appointment (he won’t be happy about a needle). Once I situate Nick right on the lap of His Creator, nestled in the arms of the One who knew him before He was even born, I feel peace. Where else would I want Nick right now? So today, I understand the verses that talk about “fear and trembling” in the presence of the Lord. For, as I trust Him I also do not know His plans. So I humbly ask for healing for Nick. I ask for wisdom for the doctors, and I ask for peace for Nick as he faces this day. I keep remembering the trip to North Carolina and how a simple moment on the journey reminded me that God longs for us to have…. As my husband and I passed through the mountains, we came to the long tunnel that we have gone through many times with our family while on vacation. The difference on this trip was the fact that we did not have children in our vehicle. As we cruised down the hill to enter the tunnel, I realized that neither of us were even commenting on what was coming….A TUNNEL!! Then as we went through the tunnel, we simply sat and talked of normal things like “Nick’s health, the conference I would be attending, etc.” Never once did we even acknowledge that WE WERE IN A TUNNEL!!!!!!!!!!! Our car held noone with….. Normally, tunnels are a big deal to our car. The kids get excited when they see them coming. Even my husband jumps in on the excitement! By the time we reach the entrance, everyone in the car is gasping for one last breath and lifting their feet up into the air! The contest has then begun! As we barrel through the tunnel, silence fills the vehicle until one by one people start losing their ability to hold their breath and let out a huge sound of relief as they breathe in new air! The person who makes it the longest without breathing wins. Usually at least one person makes it to the very end of the tunnel (with great effort) and then EXPLODES as the car reenters the natural light of the sun. Oh the fun of…. But not Friday. Tim and I just sat there and missed the tunnel. Isn’t life like this? Isn’t church like this? When we stop seeing the world through a child’s eyes, we become stiff, boring, unexcited even by the most exciting things! We miss so much when we lose……..
Jesus had something pretty important to say about children in Matthew! Just a week ago, I sat behind the wheel of my mini-van at church after dropping my kids off for VBS (I promise I have volunteered for the past 20 years…..I just needed a break this year!) crying so hard I could barely breathe. One of my dear friends had simply walked up to my window to “chat” for a minute and just happened to catch me at one of those moments when I felt the weight of life crushing my shoulders. As she began to speak, I thought to myself, “I can make it through this conversation without losing it.” However, one comment led to another and before I could even catch myself, I let my “fake” smile go, leaned my head back on the seat of the van, and literally sobbed til I could sob no more. (Well, actually I sobbed until I realized I needed to leave before a crowd gathered around my van.) I then drove home sobbing and folded an entire load of laundry sobbing. While trying to continue my housework, I answered the phone to hear yet another friend’s voice and the sobbing began again…..only to be interrupted by a call from my husband who also got the pleasure of hearing me have the biggest meltdown I have had in a loooooong time! See, the devil had a plan. He did not want me to have joy. He started chipping away at my soul before our family even returned home from Nick’s Make a Wish to the Bahamas. While on Paradise Island, he thought it would be great to see Nick with a pulled muscle in his neck. “How perfect,” he must have thought, “I’ll make Nick’s trip be a little less enjoyable for him, and I’ll give Tammy something to worry about!” The flight home was another test for the devil. By then, Nick could not even turn his head from the right to the left and was in excruciating pain. My heart carried Nick’s pain across the ocean back to the states, so by the time we landed in Louisville, you could have stuck a fork in me. I was done! Unfortunately, the tricks and schemes of satan continued. Nick’s neck got worse, one of our other kids got sick, another was having friendship troubles, and my husband and I were on the brink of not speaking for, hmmmmm, maybe forever….it seemed. It was just a tough, tough week. On top of this, I had planned to attend She Speaks (a writer/speaker conference) for the weekend, and my husband and I were actually supposed to “get away” from everything for a few days while I took in this conference. Well, when one of your kids is having anger issues and verbalizes unkind things to you,that’s enough to stop you right in your tracks from feeling any sort of calling to write or speak. Then when you are concerned with another child’s health, your desire to leave home begins to diminish rapidly. Top this off with the stress of a marriage which has been under the pressure of cancer for six years and you have the perfect recipe for disaster. Did I even mention that I didn’t feel as prepared for my publisher meetings as I had hoped? Thankfully, my husband is an encourager even when I am possessed by a demon; and thankfully, my friends keep pushing me even when I want to just sit on the path of life and have a little pity party. Because of these blessings I can sit here this morning and reflect on a life-changing weekend. See, I now have at least 8 new friends, several of which have walked the road of cancer just like me. I also have two book proposals in the hands of publishers! Most of all, I am refreshed. I feel validated. I feel able to face today. You can meet some of my new friends at http://theviewfromthefrontporch.blogspot.com/. This is the group of women God led me to sit with on Friday evening, and WOW! all I can say is, “God is so good! !” We bonded within minutes and determined to sit together at every meal and every worship service! By the end of the weekend, we were “front porch sisters” and have decided to start a blog where we can all share life from our different views! Isn’t God amazing!? The devil wants to steal your joy. He wants you to say “no” to opportunities to grow closer to God. He wants to rob you of opportunities to not only share your story but also learn from other’s stories. If you feel attacked right now, smile. Not because pain is fun, but because God has a plan and the devil is just trying to slow it down. The good news is this, if we follow God’s will, He will win every time! The devil has no power over us. He can trip us, deceive us, discourage us, and sometimes even cripple us, but he cannot STOP us from doing God’s will. As a matter of fact, God is able to take every stubbed toe, every lie, every moment of sadness, and every disability and USE IT FOR HIS GLORY! Praise God…………..HE WON!!!!!!!!!!!!!!!!!!!!!!!! I love you all so much! If you know me in “real life” or if you follow my blog/Nick’s website, you know that I have had a VERY ROUGH week! One thing after another has caused me to feel fear, doubt, negativity, blah, blah, blah. However, in spite of the worry I have about Nick, the frustration I have with teenage children, the drama of having a girl with friendship issues, and trying to stay happily married when my husband and I are both about to crack from the pressures of life, I am still thankful! That’s right! I am thankful! Thankful for a God who promises to never leave me or forsake me. Everything else seems so insignificant when I hold it up to the truth that God loves me……no matter what life may be like in my somewhat foggy dreamworld! I just wanted to say I will be gone for three days, and I got everything printed that I could print……I feel a little less prepared than I had hoped, but oh well. If God has a plan, it’s hard to mess Him up. If it is not His time for me to go this direction, then no matter how hard I worked it wouldn’t be enough. So, I am going to sleep peacefully knowing it’s all in His hands. Why didn’t that occur to me while I was stressed yesterday and earlier today?!?! Life is like that, isn’t it? Everything looks a little more logical when we look back on it. I love you all! Nick is doing well. He goes back to the pediatrician next Wednesday at noon. As I sit here at the kitchen computer with another laptop beside me on a barstool, I find myself moving back and forth between computers and documents saved on each trying to prepare for a conference that I have been looking forward to for months! I also find myself feeling a little stressed. See, I thought I had this entire month to get all of my things in order. But when we discovered that Nick had another brain tumor four weeks ago, my life once again turned upside down. I have literally been in a constant whirlwind since that day. There has been a surprise birthday party for Nick, the mass-redecorating of his bedroom, a trip to Virginia for a motorcycle event for Nick, a trip to the Bahamas for his Make a Wish trip on top of a very scary seizure that sent Nick in an ambulance two and a half hours away for treatment and observation. I am exhausted. And today, I am trying to keep my commitment to Olivia who planned a swimming party months ago and has over 10 friends coming at 2 to stay until after Vacation Bible School tonight! YIKES! So, why I am taking time to write this blog entry!?!? Because I need prayer! I looked up the origin of down to the wire and found out that it became a saying when horse racing first began and they had to figure out a way to know which horse came in first. They would hold a wire across the finish line and whichever horse’s nose moved the wire first was the winner. Today they use a ribbon or tape. The phrase is used in any situation where there is suspense about the outcome. Believe me, I have great suspense about my own outcome! Will I really have everything printed and ready to present? I’ll let you know! For now, I am simply a horse in the race trying to make it…..
Blessings and thanks for every prayer! So many fun memories from our trip to the Bahamas dance through my mind – from watching my boys and husband parasail to swimming with the dolphins! From eating at all kinds of different restaurants to free coffee 24/7 in the hotel dining area! From walking through huge aquariums filled with every type of sea creature you can imagine to riding in intertubes through lazy rivers and roaring rapids! But as I sit here tonight on my back porch listening to crickets chirping, my dog breathing deeply on the chair near me, and cars moving quickly down the road nearby, my heart feels thankful to be back home! On our final day in the Bahamas, we could only muster the energy to lay by the pool and occasionally dip in it for a short game of ball tossing. The thought of soaring down a water ride or walking a long, sandy beach was more than our weary bodies could handle! I am yawning as I click away at the keyboard just long enough to say how much I love you all and how thankful I am for organizations like Make A Wish which gave our family a vacation of lifetime! We never would have had this opportunity any other way! Looking up at the full moon, I have to smile knowing that my new Bahamian friends are looking up at the same beautiful moon many, many miles away! And I am thankful that now, even on a tiny island in the middle of the Atlantic Ocean, there are prayers being lifted for my son Nick! Thank you, God, for creating an amazing world that in many ways is gigantic and yet in other ways is so small because of Your ability to connect us through our love for You! I may be one tired “Bahama Mama,” but I am also one thankful lady! !